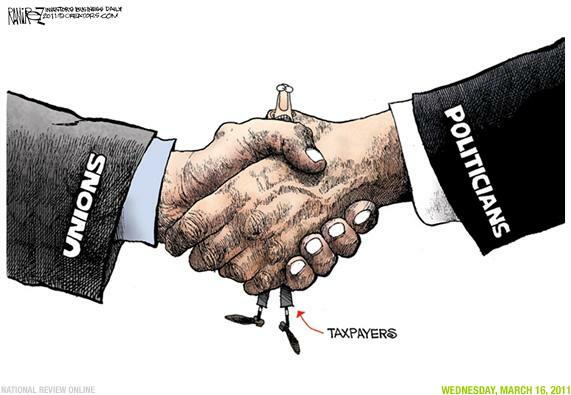 As a taxpayer, I don’t like the fact that government employees get paid more than folks in the private sector. But the big difference between bureaucrats and regular workers isn’t so much the pay, it’s the fringe benefits. 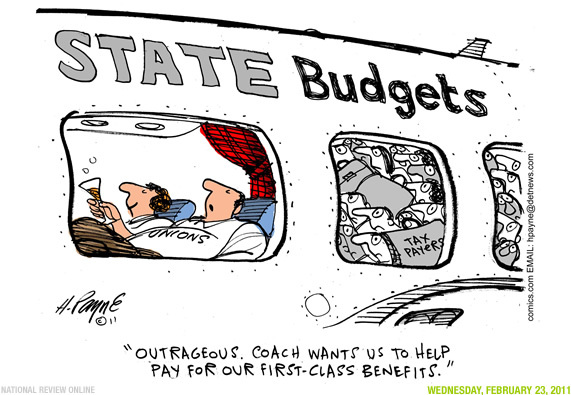 And perhaps the biggest difference of all is that government bureaucrats get far more lavish retiree benefits. Sounds like a sweet deal, at least if you get a coveted job (or even six jobs!) with a state or local government. It’s not a good deal for taxpayers, though, and the entire system is rather unstable because politicians and union bosses have conspired to create huge unfunded liabilities that threaten to create a death spiral for state and local governments. Simply stated, why should productive taxpayers continue to live, work, and pay taxes in places where a huge chunk of money is diverted to pay off past promises rather than to deliver goods and services (education, parks, trash pickup, police, etc) that have some value? Indeed, this is a big reason why places such as Detroit already have collapsed. 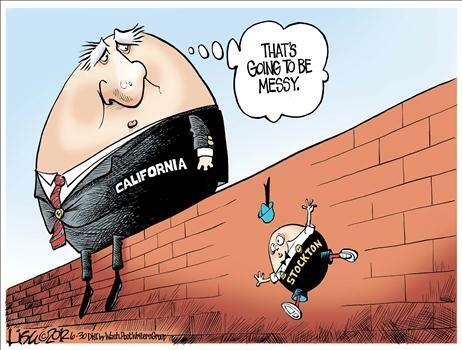 And I fear it is just a matter of time before other local government (as well as some states such as California and Illinois) reach the tipping point. But perhaps you think I’m being too dour? Yes, I’m prone to pessimism because of my low level of faith in the political elite. In this case, however, any sensible person should be very worried. Let’s look at what some experts have to say about these issues. Here are some passages from Steve Malanga’s Wall Street Journal column from earlier this month. He starts by explaining that Jerry Brown’s big tax hike for education actually has very little to do with helping kids to learn (not that more money is the recipe for better education, as shown by this jaw-dropping chart, but that’s a separate issue). Instead, the money is being diverted to finance the lavish pension system. Decades of rising retirement benefits for workers—some of which politicians awarded to employees without setting aside adequate funding—and the 2008 financial meltdown have left American cities and states with somewhere between $1.5 trillion and $4 trillion in retirement debt. …the tab keeps growing, and now it is forcing taxes higher in many places. A report last June by the Pennsylvania Association of School Administrators found that nearly every school district in that state anticipated higher pension costs for the new fiscal year, with three-quarters calculating their pension bills would rise by 25% or more. Subsequently, 164 school districts received state permission to raise property taxes above the 2.1% state tax cap. Every one of the districts cited rising pension costs. In West Virginia, where local governments also face big pension debts, the legislature recently expanded the state’s home rule law—which governs how municipalities can raise revenues—to allow cities to impose their own sales taxes. The state’s biggest city, Charleston, with $287 million in unfunded pension liabilities, has already instituted a $6 million-a-year local sales tax devoted solely to pensions, on top of the $10 million the city already contributes annually to its retirement system. At least five more cities applying to raise local sales taxes, including Wheeling, also cited pension costs. The column also has lots of material on the mess in Illinois. The city of Peoria’s budget illustrates the squeeze. In the early 1990s it spent 18% of the property-tax money it collected on pensions. This year it will devote 57% of its property tax to pension costs. Reluctant to raise the property levy any more, last year the city increased fees and charges to residents by 8%, or $1.2 million, for such items as garbage collection and sewer services. Taxpayers in Chicago saw the first of what promises to be a blizzard of new taxes. The city’s public-safety retirement plans are only about 35% funded, though pension costs already consume nearly half of Chicago’s property-tax collections. All this sounds depressing, but it’s actually worse than you think. We also have to look at the promises that have been made to provide health benefits for retired government employees. Robert Pozen of Brookings has some very sobering data. Public-pension funds have garnered attention in recent years for being underfunded, but a more precarious situation has received much less notice: health-care obligations for public retirees. …only 11 states have funded more than 10% of retiree health-care liabilities, according to a November 2013 report from the credit-rating agency Standard & Poor’s. For example, New Jersey has almost no assets backing one of the largest retiree health-care liabilities of any state—$63.8 billion. Only eight out of the 30 largest U.S. cities have funded more than 5% of their retiree health-care obligations, according to a study released last March by the Pew Charitable Trust. New York City tops the list with $22,857 of unfunded liabilities per household. …Total U.S. unfunded health-care liabilities exceeded $530 billion in 2009, the Government Accountability Office estimated, but the current number may be closer to $1 trillion, according to a 2014 comprehensive study released by the National Bureau of Economic Research. By the way, these retired government workers are covered by Medicare, but Pozen explains that the unfunded liabilities exist because so many of them retire before age 65. And their health plans sometimes cover Medicare premiums once they turn 65. State and local governments typically pay most of the insurance premiums for employees who retire before they are eligible for Medicare at age 65. That can be a long commitment, as many workers retire as early as 50. Many governments also pay a percentage of Medicare premiums once retired workers turn 65. States are trying to deal with this healthcare-driven fiscal Sword of Damocles. Since 2010 more than 15 states have passed laws to reduce health-care cost-of-living adjustments—automatic benefit increases linked to the consumer-price index. Courts in eight states upheld these reductions on grounds that cost-of-living adjustments should not be considered a contractual right. Only Washington’s law was struck down in 2011, and the case is now on appeal. Some state and local governments—Nevada and West Virginia, for example—have increased deductibles and scaled back premium subsidies. Others like Ohio and Maine have reduced the health-care benefits provided to retirees. Several years ago Pennsylvania changed early retirement eligibility to 20 years of service from 15. In many cases, though, I fear these reforms are a case of too little, too late. So long as the fiscal burden of providing pensions and healthcare expands at a faster rate than the private economy, states and localities will push for more and more taxes to prop up the system. But people won’t want to live in places where a big chunk of their tax payments are diverted to fringe benefits. So they’ll move out of cities like Detroit and Chicago, and they’ll move out of states like New Jersey and Illinois. 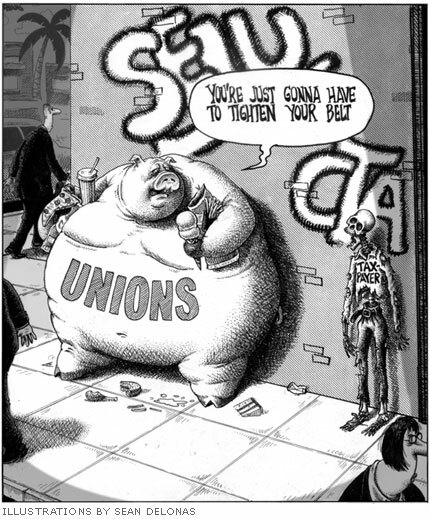 So the bottom line is that politicians and government employee unions engineered a great scam, but one that ultimately in many cases will self destruct. And the lesson for the rest of us is that government bureaucrats should not get special goodies, particularly when they are financed by nothing other than promises to screw future taxpayers. Pensions for government workers should be based on the defined-contribution model, and healthcare promises should be more limited and in the form of health savings accounts. But how do you get these much-needed reforms when the government unions finance the politicians who are on the opposite side of the negotiating table?!? P.S. Here’s a good joke about government bureaucracy. Here’s a similar joke in picture form. And we find the same humor in this joke, but with a bit more build up. And now that I’ve given it some thought, there’s more bureaucrat humor here, here (image near bottom), and here. I suspect these local pols’ plan is to kick the can down the road until a cooperative congress and president can be induced to rescue the plans with a bailout paid by federal taxpayers or more debt. It’s definitely time for conversion from defined benefits to defined contributions. Government decision makers love giveaways in the future that don’t hit their current budgets. Defined contributions hit current budgets and that will stop future excesses. At the time of conversion, previously defined benefit commitments should be converted into current value liabilities, which necessitate a one-time defined contribution to replace future defined benefit liabilities. This one-time contribution could be financed through bond issuance. It will be found that many government units are essentially bankrupt and cannot get the financing required. There will need to be special legislation to fast track benefit bankruptcy workouts, which would include reductions of previously established benefits. While the beneficiaries might scream at this reduction, if the system is not fixed now, at some point expected benefits will disappear completely.